Shackles There are 49 products. The adjustable shackle has to be the best alternative to the everyday curved buckle. These are stainless steel and have 3 holes for adjustment with a larger hole at the end for your cord. Stainless Steel U Shackle PURPLE 53 mm ADJUSTABLE WEDGE design 1, 5 or 10 per pack These are stainless steel and have 4 holes for adjustment. The adjustable shackle is another great option to create a custom paracord survival bracelet. These are stainless steel and have 4 holes for adjustment. QUICK RELEASE w/ clevis pin. 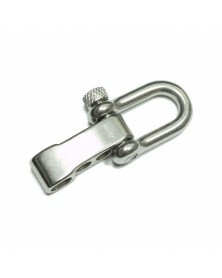 Small, heavy duty stainless steel shackle. ADJUSTABLE - 2 holes for adjustment and a 3rd hole for attaching your paracord. Adjustable stainless steel bow shackle. Great for making double cobra bracelets. Very Strong and useful! QUICK RELEASE w/ clevis pin. 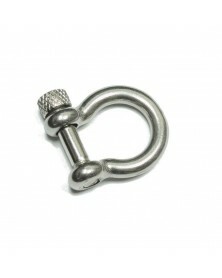 Large, heavy duty stainless steel shackle. 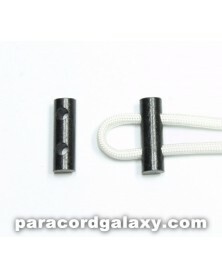 ADJUSTABLE - 3 holes for adjustment and a larger 4th hole for attaching your paracord. The adjustable shackle has to be the best alternative to the everyday curved buckle. These adjustable shackles are metal alloy with 3 holes for adjustment and a larger 4th hole for attaching your paracord. The adjustable shackle has to be the best alternative to the everyday curved buckle. These adjustable shackles are a metal alloy with 2 holes for adjustment and a 3rd hole for attaching your paracord. They have a small compass built right in to the adjustable piece! 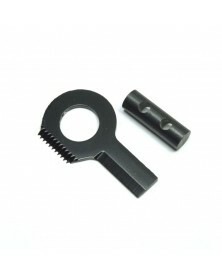 Small Fixed Eye Snap Shackle - Black Powder Coated Stainless Steel. These snap shackles are lightweight, very strong and have a quick release. Inner opening on fixed-end is 3/8" Snap opening is 1/2" Overall length and width are 1 3/8" x 1"
The adjustable bow shackle has to be the best alternative to the everyday curved buckle. 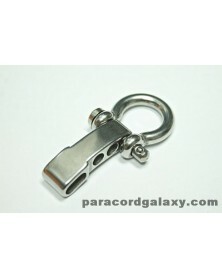 These are stainless steel and have 3 holes for adjustment with a larger hole at the end for your cord. The adjustable shackle has to be the best alternative to the everyday curved buckle. These adjustable shackles are metal alloy with 3 holes for adjustment and a 4th hole for attaching your paracord. Large Fixed Eye Snap Shackle - Stainless Steel. 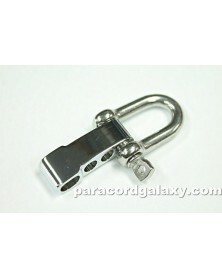 These heavy duty snap shackles are very strong and have a quick release. Inner opening on fixed-end is 5/8" Snap opening is 3/4" Overall length and width are 2" x 1 1/4"
Small Fixed Eye Snap Shackle - Stainless Steel. These snap shackles are lightweight, very strong and have a quick release. Inner opening on fixed-end is 3/8" Snap opening is 1/2" Overall length and width are 1 3/8" x 1"
Designer polished steel shackle for paracord. Add a whole new level of style to your paracord bracelets and straps with this shackle. The solid body looks great by itself or gives you room to get creative and add your own logo. Large Fixed Eye Snap Shackle - Black Powder Coated Stainless Steel. 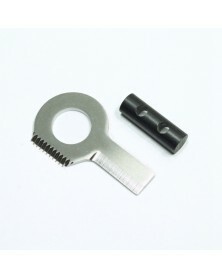 Inner opening on fixed-end is 5/8" Snap opening is 3/4" Overall length and width are 2" x 1 1/4"